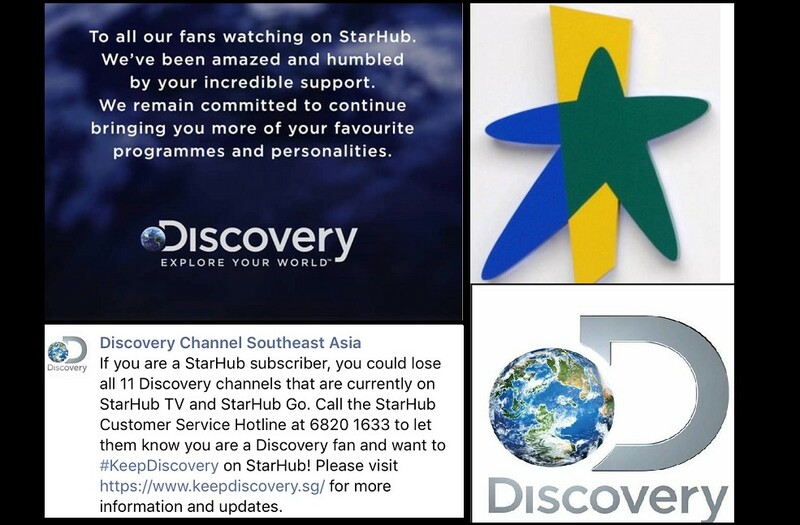 Starhub, you send us letter informing of cancellation of Discovery and it’s sisters’ channels. By giving $4 monthly pathetic bill rebate for 5 months from July to November 2018, you think you can appease customers like us, who have been subscribing to all these educational channels all these while. Instead, you have not pre-warned us to choose from other alternatives, without subscribers’ consultation, but go ahead what you damn think it’s the right thing to do on your damn part, canceling all these channels and installing new travelxp(ch 427), makeful(436), curositystream(422) and gusto tv(434). These damn channels are consider “crap” channels and serve no purposeful to me or my family. You deny our request to cancel the contract pre-maturely and threaten with early penalty charge! Your pathetic $4 rebate for 5 months versus the early termination charge! Let us remind you, when you persuaded us to sign for a 2 years’ extension in March 2017, all channels remain status quo. Out of the blue, you published on news, by announcing the go-ahead to cancel existing channels. You are nothing but one screw-up telco, looking to profiteer but not working towards customers’ loyalty. There is nothing we can do at this moment but vent our frustrations in this platform. You win now but you will not have the last laugh! Our contract ends March 2019. Rest assure, double confirm and chop-chop, we will cancel when the last day of contract is over and we shall return you the damn set up box for good. Please note there are many ways to watch Discover channel, TLC, Animal Planet, Discovery Asia, Discovery Science, AFC, Food Network etc. You are not the only damn telco offering such package and today you lose me as a subscriber, you may think it’s alright. We pray for “subscribers’ power”, we will hope more will follow suit and cancel your damn subscription. Don’t think you monopolize the whole cable-TV market. There will be more to lose on your part! Previous ArticleOWNER OF PRAWN NOODLE GAMBLE TILL SHOP CLOSE.